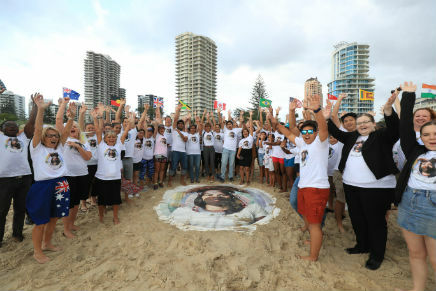 In a joyful celebration of cultural diversity, Indian students this morning (Wednesday 4 April) were among hundreds of fellow international students, Gold Coast locals and visitors toform a symbolic Human Rainbow. Games officially begins later today. Coast was a melting pot of diversity. Coast’s Bond University recording one of the nation’s largest student increases in 2017. India is one of the top five countries in the Gold Coast’s international student cohort. multicultural society with almost one-third of its residents born overseas. “Our city is a welcoming one with such a vibrant student population,” she said. and accommodation will enable a great platform for growth,” she said. receive plenty of support from their Gold Coast-based countrymen and women. the Gold Coast’s history, it is also the largest sporting event in Australia this decade.